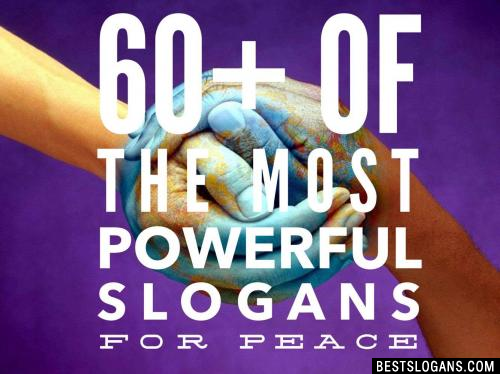 Explore our unique and catchy list of global peace slogans for kids & adults in english. 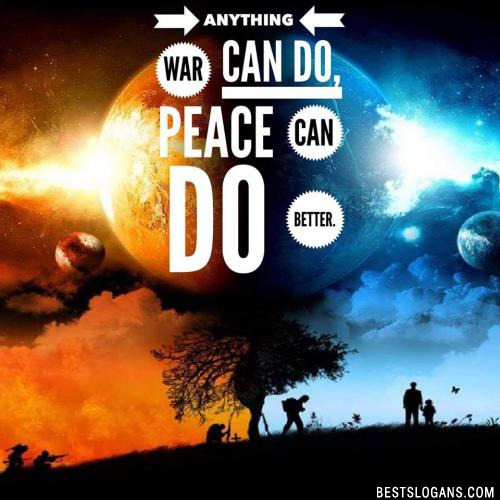 We must learn to live in peace and harmony even among the wars this world brings. In recorded history since 3600 BC, over 14,500 major wars have killed close to four billion people - two-thirds of the current world population. Here are a a few more shocking facts about war and murder. 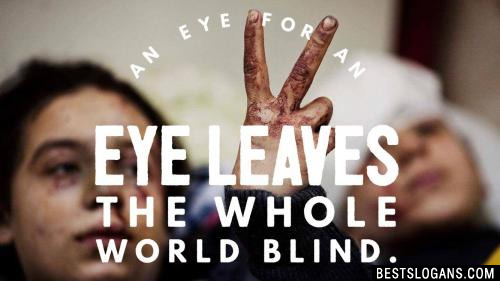 War has killed 2 million children in the last twenty years. In the last 5600 years there have been only 292 years of peace. By the age of 16, the average American child has witnessed 18,000 murders on television. "Everyone must be committed in the matter of peace, to do everything that they can ....Peace is the language we must speak." Words to live by, by none other than the great Pope Francis. 1. Make a personal commitment to nonviolence. 2. Show a child how to be kind to animals. 3. When you see someone in trouble, whether he or she is lost, confused, upset, or has fallen, don't act like you don't see the person - provide some help. 4. Show a child how to achieve calmness through deep breathing. 5. Speak out against prejudice and discrimination when you see it. 6. Regard people who hurt your feelings as your personal teachers of how to maintain a peaceful nature. 7. Choose a career that yields only good things for our families, our communities, and our planet. 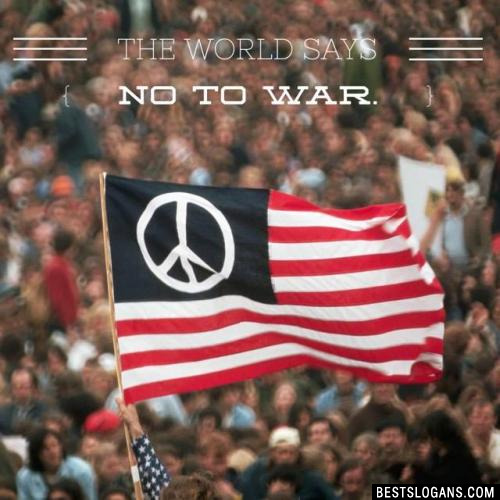 The World Says No To War. 3 If you're not outraged you are not paying attention. 4 It is possible to live in peace. 7 Peace should be in the heart. 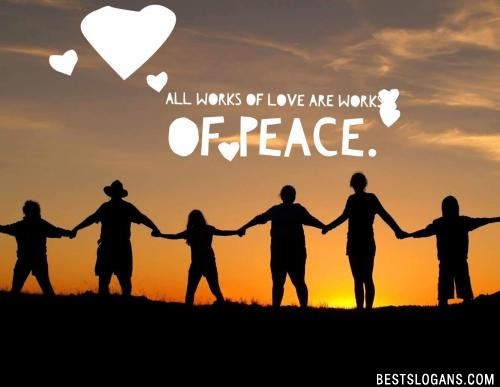 All works of love are works of peace. 10 WAR is not healthy for children and all living things. "Darkness cannot drive out darkness; only light can do that. Hate cannot drive out hate; only love can do that." -Martin Luther King, Jr.
11 If you want world peace, fight for justice. 13 To Peace don't be blind, Be considerate, Be kind! 14 War let's restrain so Peace we can obtain. 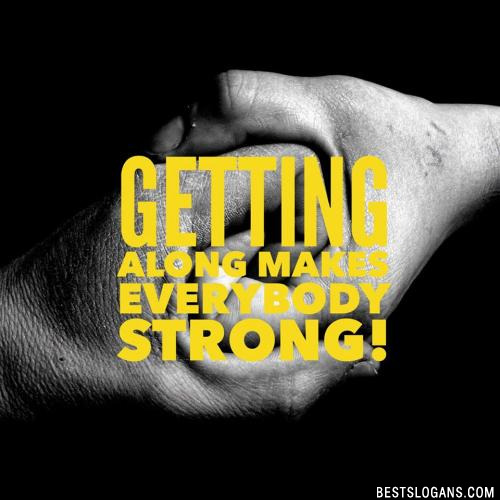 Getting along makes everybody strong! 16 Peace is angel, war is ghost. 17 War is a disgrace, let's keep peace in this place! 18 We have so much more to gain if peace we can obtain! 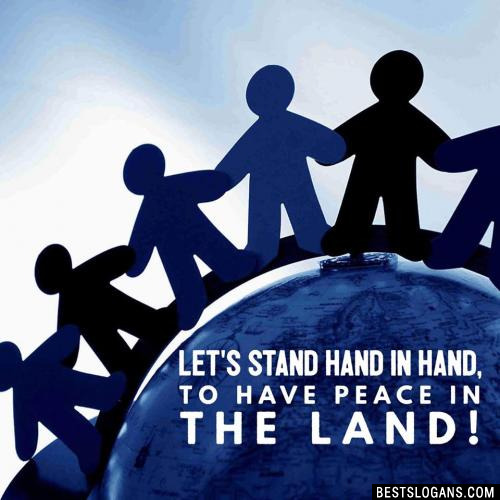 Let's stand hand in hand, to have peace in the land! 20 North, South, East, West, Let Peace be our Quest. 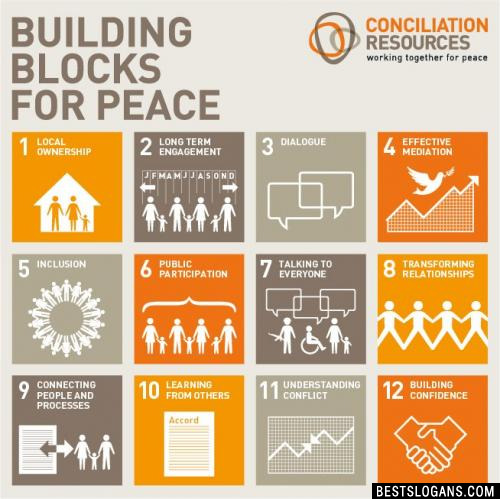 Can you think of a good Short Slogans On Peace we're missing? Or come up with a clever one of your own. Please share below.